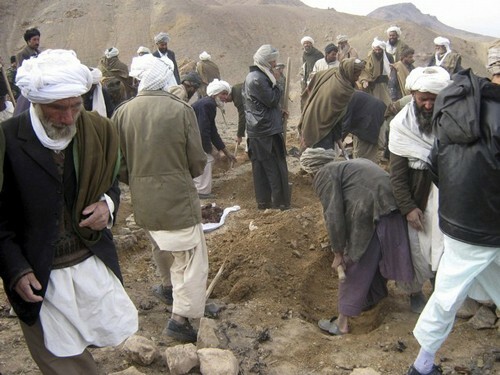 Eyewitness say six women, five men, and four children in the village of Karez Sultan were killed in the strike. Several hundred animals are also said to have been killed there. United States forces in Afghanistan claim to have killed up to 15 militants associated with an infamous warlord in Herat province in an airstrike on February 16, but district officials and eyewitnesses say that the dead were a family of Kuchis, or nomads, who were camped out nearby. “A Coalition forces precision strike targeted Ghulam Yahya Akbari, a key insurgent commander, near Gozara district, Herat province, Monday. Killed in the attack were up to 15 militants suspected of associating with Yahya,” read a press release issued by Lieutenant Commander Walter Matthews of the US Forces Public Affairs Office. Yahya himself, it seems, was not hurt in the attack, despite an earlier Coalition press release reporting his death. “They tried to hit me but struck a family of Kuchis instead,” said Yahya, speaking by telephone to IWPR, Tuesday, February 17. 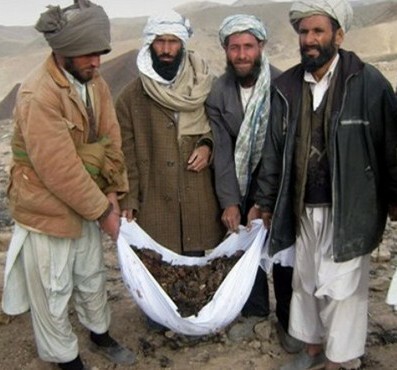 Ghulam Mahboob Afzalzada, district governor of Gozara, insisted the strike had claimed the lives of Kuchis, a nomadic people who shepherd their animals throughout the country. “There was a [Kuchi] man and his family, including women and children,” said local resident Gul Ahmad, who was standing near the site of the strike Tuesday afternoon. Speaking by telephone Tuesday morning, Captain Elizabeth Mathias said that US military had no information on civilian casualties. The press release, issued later in the day, said that the Coalition forces were arranging for a combined Coalition and Afghan assessment team. Civilian casualties are an extremely sensitive issue in Afghanistan, causing anger among the population and tension with the Afghan government. President Hamed Karzai has become increasingly outspoken in his criticism of foreign troops, who, he says, carry out their operation without sufficient coordination with the Afghan government. There was a 40 per cent rise in civilian casualties last year, according to a United Nations report on Protection of Civilians in Armed Conflict, released on Tuesday. 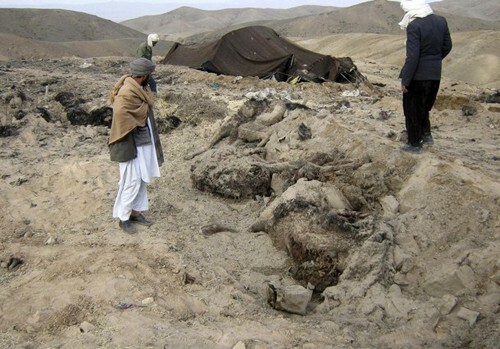 In all, 2118 civilians were killed, 828 of them by Afghan government or foreign forces. However, said the report, the figures could be much higher. “UNAMA (United Nations Assistance Mission in Afghanistan) does not claim that the statistics represented in this report are complete; it may be that, given the limitations of the operating environment, UNAMA is underreporting civilian casualties,” read the report. The UN report also questioned the ability of the military to investigate thoroughly in cases where locals allege that civilians have been killed. “International forces showed themselves more willing than before to institute more regular and transparent inquiries into specific incidents, although the independence of these inquiries is still questionable,” it said. Several high-profile incidents last year undermined the credibility of the international forces in reporting civilian casualties. First came an attack in July in Nangahar province that killed 47 members of a wedding party, including the bride. In August, a bombing in Herat province left more than 90 civilians dead, according to the UN and the Afghan government. In both instances, the international forces claimed to have targeted and killed only militants. Only after many weeks and mounting pressure did they acknowledge that some intelligence mistakes may have been resulting in civilian deaths. Yahya, who is also known as “Siyawooshan” after his home village in Gozara district, is a controversial figure with a long and colourful history in Herat. He began his fighting career as a jihadi commander associated with Mohamamd Ismail Khan, former “Emir” of Herat and currently minister of power and water management. An airstrike by the United States-led military coalition killed 13 civilians and 3 militants last Tuesday in western Afghanistan, not “up to 15 militants” as was initially claimed by American forces, military officials here said Saturday. The civilians killed included three children, six women and four men in the Gozara district of Herat Province, in addition to three people suspected of being Taliban fighters, according to an aide to the provincial governor. 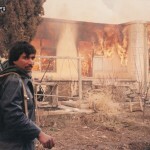 At the time of the mujaheddin civil war, in the mid-nineties, Yahya was mayor of Herat, where he earned a reputation for honesty and brutality in almost equal measure. During the Taliban regime, he fled to Iran, returning to battle the Islamists in the Herat area. He became head of the department of public works after the fall of the Taliban, and worked once again with Ismail Khan, until the latter’s appointment to Kabul. Yahya did not get along with Ismail Khan’s successor in Herat, Sayed Hussein Anwari, whom he accused of unfairly distributing land and positions to the Shia minority. Sacked by Anwari, Yahya retreated to his native Gozara district and took up arms against the government. For the past two years, he is said to have carried out missile strikes against the UNAMA compound in Herat, the nearby foreign military base and airport. He is also reported to have supported himself and his men by kidnapping for ransom, including one Indian citizen who reportedly died while in Yahya’s custody. He has been linked to the Taliban, al-Qaeda, and Gulbuddin Hekmatyar’s Hezb-e-Islami faction, but insists he is operating on his own. While the US forces insist that Yahya is “known to move throughout the mountains in this area, hiding amongst the civilian population to avoid detection”, he is easily accessible to reporters, who call him on his mobile phone to arrange interviews. Yahya is feared by many and revered by some, according to those who live under his iron rule in Gozara district. Most ordinary Heratis just want to live in peace. Shapoor Saber is an IWPR trainee in Herat. Afghanistan is the fifth least developed country, with 42 percent of its estimated 27 million people living on less than US$1 a day, according to the UN Development Programme.